How to install the D-Link mydlink plugin on Mac OS 10.12 (Sierra)? 1. Go to https://d2okd4tdjucp2n.cloudfront.net/misc/mydlinkplugin.zip to download mydlink service plugin on your Mac. 2. Click Finder, go to Downloads, double-click the mydlinkplugin.zip to unzip the file. 4. Open Downloads, Internet Plug-Ins windows, drag the unzipped file from Downloads to Internet Plug-Ins folder. 5. 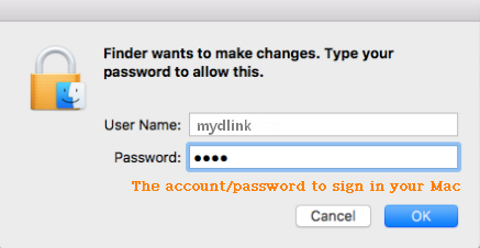 Click Authenticate and type Mac’s password to authorize installation of mydlink player plugin. Please restart your browser after completed mydlink plugin installation. Why is the D-Link mydlink portal not working with Firefox 52 (and above)? What operating systems and browsers does the D-Link mydlink web portal supports? How do I access D-Link mydlink Baby camera remotely by using mydlink Web Portal? How to remove/block users from the D-Link wireless network on mydlink router? How to add my D-Link DIR-605L to the mydlink account? How to access D-Link mydlink DCS-931L camera remotely?